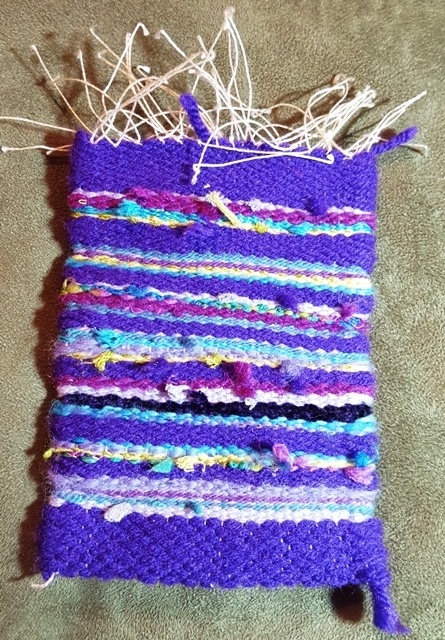 I'm finally letting myself start a new project, since I'm supposed to be off my foot. It''s a project I've wanted to do for awhile, actually. 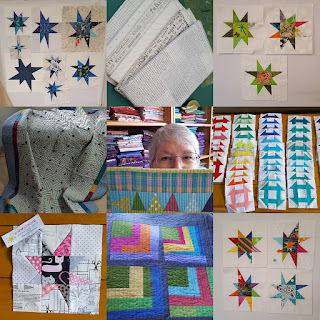 Last year on Instagram @stephjacobsondesigns had a Plus block quilt-along that I really wanted to do, but didn't have time for. So, now is the time! If you're interested, you can see more about this on Steph's blog here. 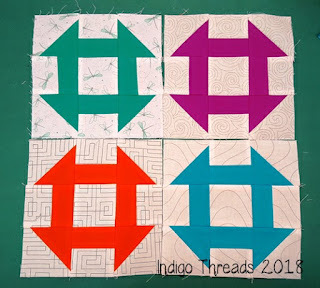 Here is the diagram of the Plus block I'll be doing. 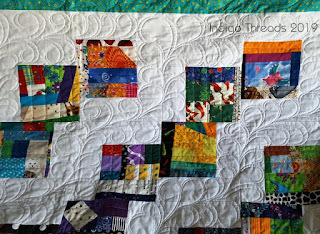 This makes a 10"block, which makes math for the quilt really easy! Always a "Plus" in my book! Hee hee! 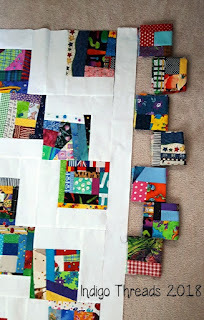 One could use a jelly roll for this, but I'm working with half-yard pieces and cutting my own strips. 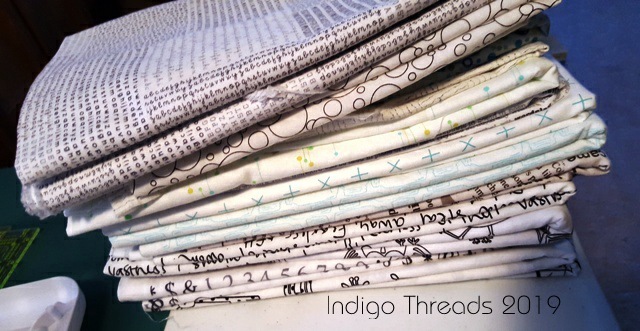 Here are the fabrics I'm using. 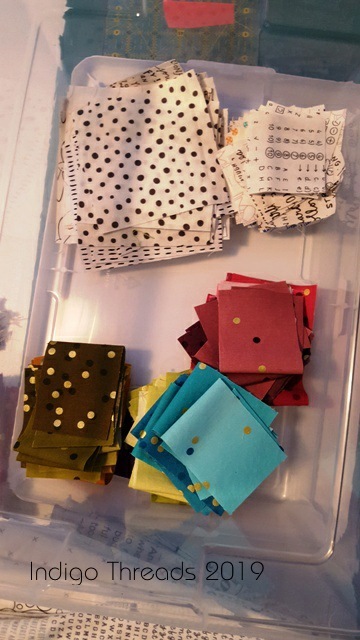 They are Ombre Confetti Metallic Dots by Moda, that I found on my trip to Missouri last year. 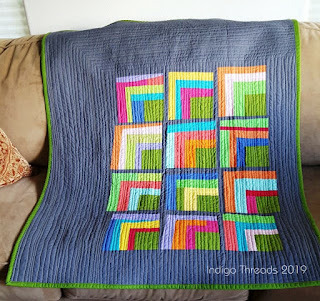 I fell in love with them, and have been searching for a pattern to use that would highlight the ombre aspect. 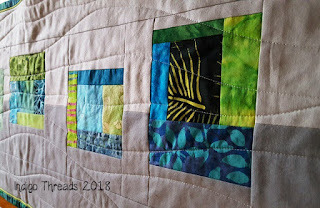 I'm using Low Volume fabrics in the backgrounds, as I love Low Volumes. 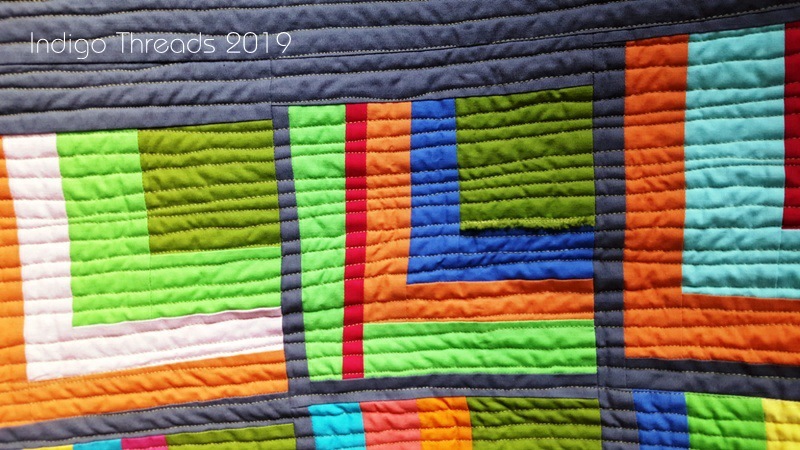 My Low Volume quilt is one of my favorites. 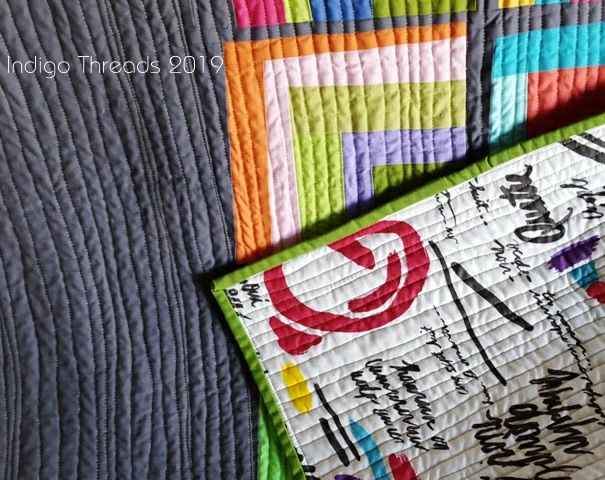 They're so perfect for a more interesting background too and there is a lot of background in the Plus quilt. I've collected a good-sized group of them over the years. This is just some of what I'm using. Right now I have a table set up in the living room and I'm just cutting fabrics. 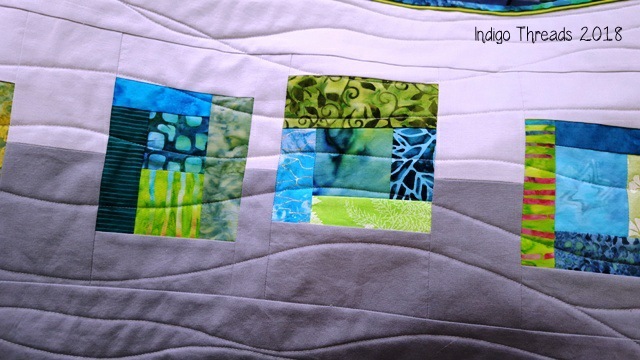 Here is my first "practice" block. I've learned to make a practice block before I get too far along, just to make sure everything is copacetic. Doing that has saved me some grief over the years! I've got one more stack of fabrics to cut up and then I can start sewing! Yay! 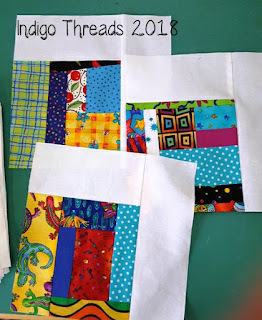 I can't wait, although to be truthful, I love cutting fabric. I could do it all day. 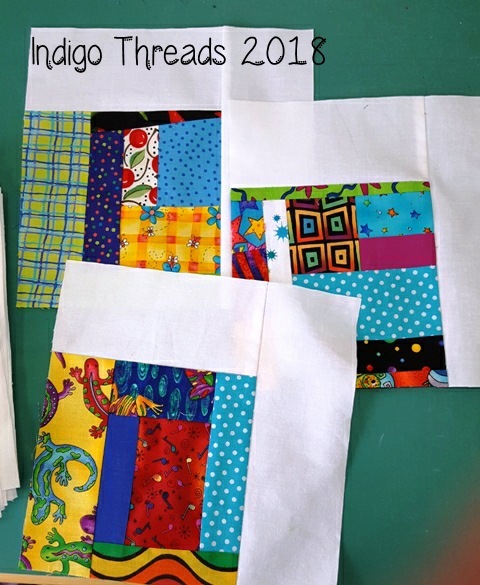 I find there's something quite soothing about chopping up big pieces of fabric into small, usable pieces of fabric. As you can see from this photo, the Orthopedic doctor has given me a cast. 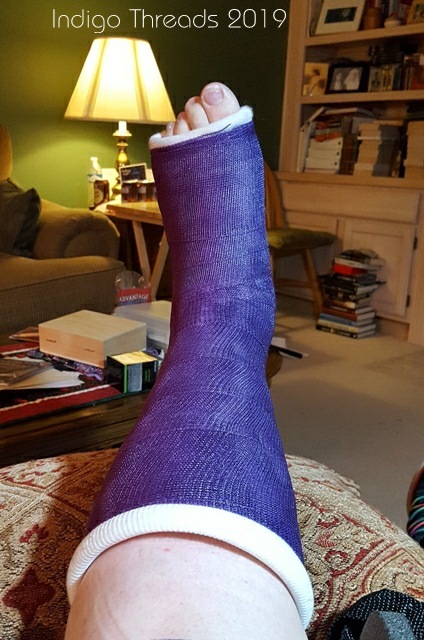 This is my very first cast, although not my first broken bone. The cast is made from fiberglass now, so much lighter than the old ones, I understand. I''m not in any pain, just some discomfort. And it's awkward. 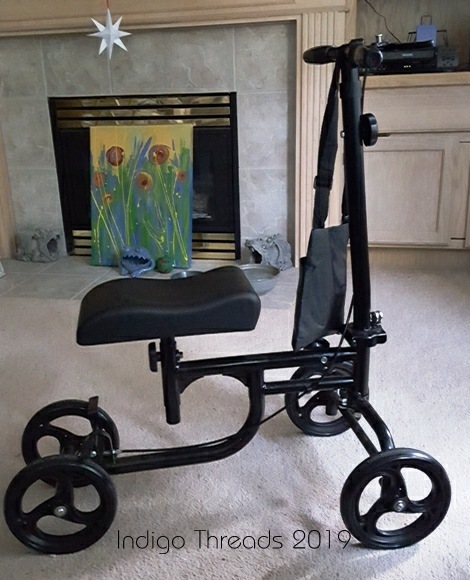 And because I'm terrible at crutches and they're killing my arthritic hands, the doctor prescribed a knee scooter for me. 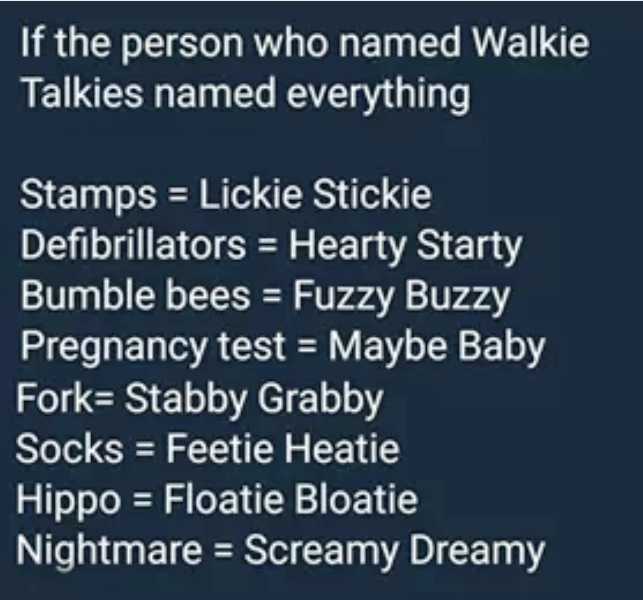 I saw this on Facebook and it made me and my son giggle. 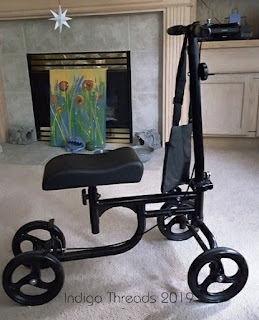 So when I got the knee scooter, my son promptly dubbed it the "Kneelie Wheelie". This is a lifesaver! I've gotten pretty good at getting around with this. Unfortunately, we live in a 2 story house. So, I go up and down the stairs on my bum, and generally do that only in the morning and at bedtime. Upstairs I get to use the crutches, so I don't spend much time up there. Our old kitty Shade, who won't come out of our bedroom because he's terrified of our son's dog, isn't too happy with that arrangement! Poor baby. So, in 4 weeks I get the cast off and get another Xray to see if the break is healed yet. If not, then another cast for a couple more weeks. I'm hoping and praying that 4 weeks will be enough! 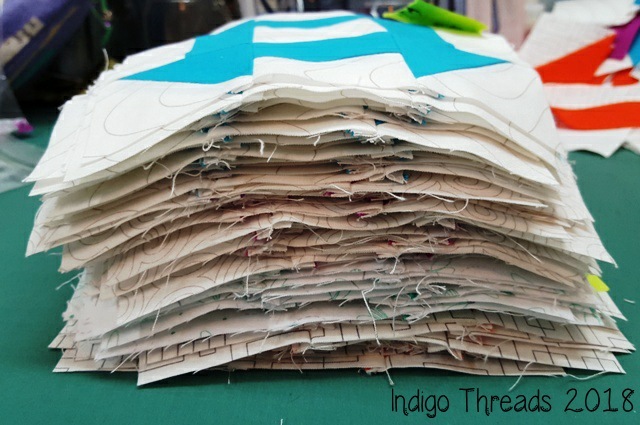 In the meantime, I hope to make some progress with my new project! Yay! I have finally finished and am able to post my project that I started back in March of 2017, in a class (the last class!) with Gwen Marston. You can see where I started this project on this post. 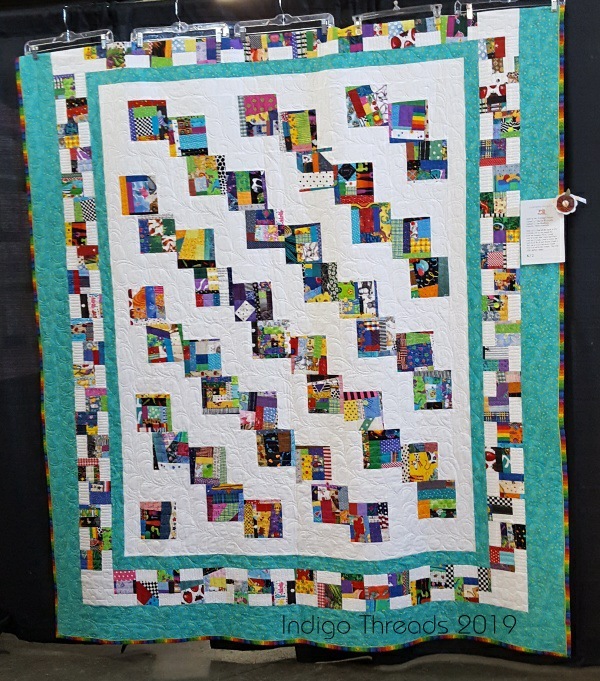 I actually had this finished for the guild quilt show at the end of September, but this is the first it's been posted anywhere. It's so difficult to get a decent photo here - it's usually so dark and gloomy. 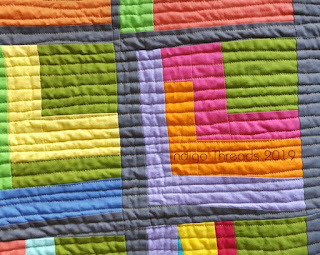 That's why I call this quilt "Rainbows On A Cloudy Day". It's cloudy here, more often than not. I've also never seen so many rainbows as here in the Northwest - more than I've ever seen anywhere else I've lived. No matter how many times I see a rainbow, they are always magical! 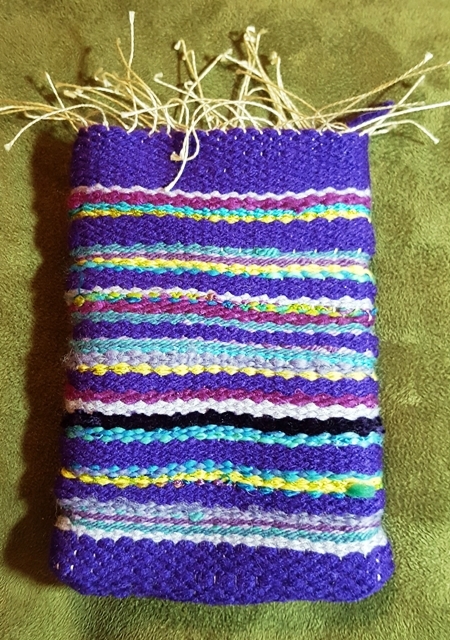 I actually picked out the colors for this before I'd decided what pattern to use. That was my sister's suggestion, as I had no idea where to start for something for this class. 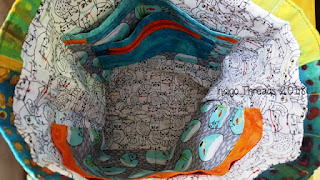 I was a little intimidated to use only solid fabrics! So I decided to break out of my usual color palette and try something a little different. I picked what seemed to me like kind of tropical colors. 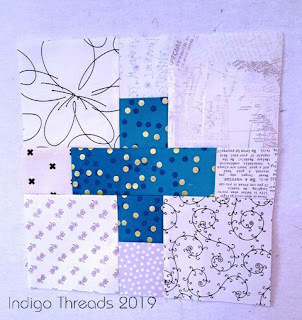 The grey background came about because I was using a grey wall at the workshop to pin up my blocks on, and I really liked how the dark set off those colors. 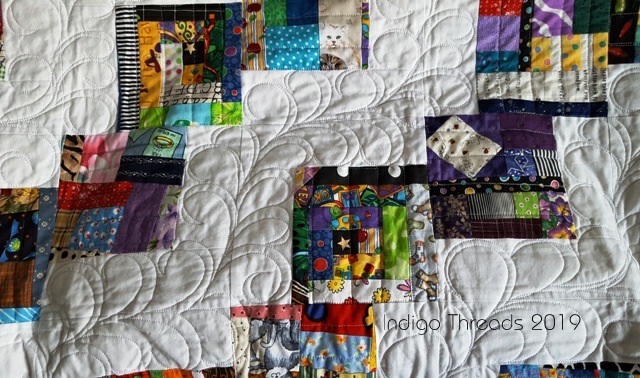 You can see here that I used a little bit of the raw edge "fluff" on a few of my middle squares. Just something fun and different to do. I probably could have used more. Oh well. And I like Gwen's idea of letting the colors "bleed" from one area to another. I think that makes the blocks a little more interesting. 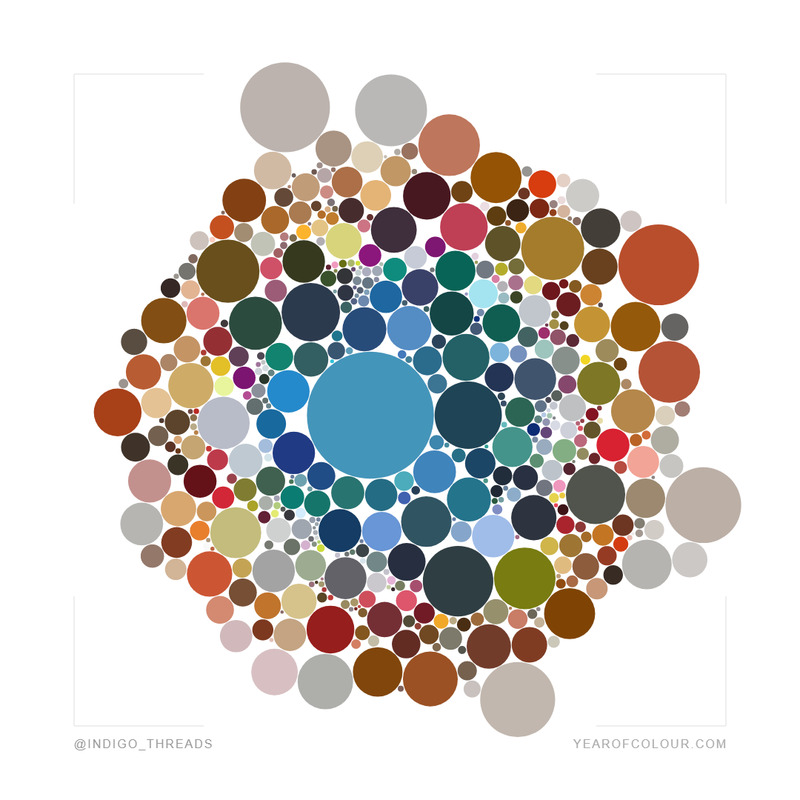 I also randomly changed colors in a number of the rounds in the blocks - again, just something fun and interesting. 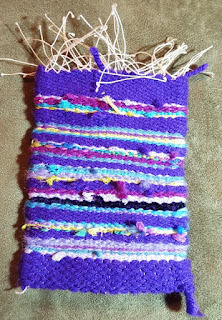 And for the back, I used a piece of fabric that had been given to me. It was just the right size! I quilted this in a hurry, to be done in time for the quilt show. 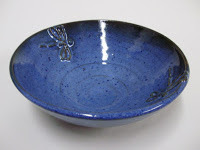 But I think it came out OK in spite of that. 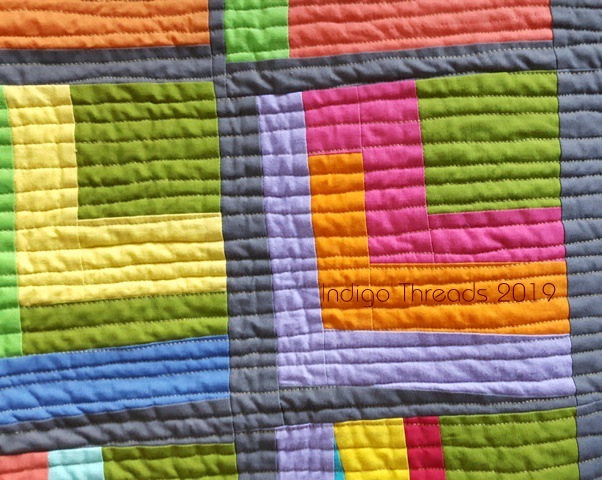 Those not-real-straight straight lines do take some time to quilt! And then I decided, for something a little out of the ordinary, to have the quilting lines turn the corner in the border. 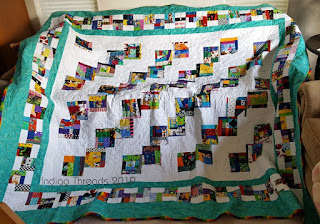 The quilt crinkled up pretty well and I haven't even washed it yet. 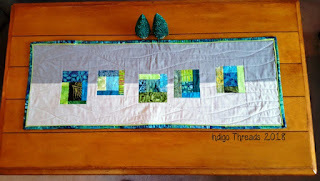 This ended up being a little too big for the space I had in mind, so it doesn't have a home to hang in yet. I'm still thinking of where to put it so I can enjoy it. On a personal note, the MRI I had last Wednesday told me that I have a broken ankle! It's a very difficult-to-see incomplete fracture. 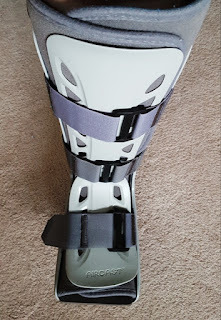 I now am using crutches and have a boot to wear to support the ankle. I see the Orthopedic doctor next week. And actually the ankle feels better than it has since the accident. Some of that is staying off of it, like I'm supposed to, and some it is ? Maybe healing? That would be nice! It will be interesting to hear what the doctor has to say. I'm not enjoying the crutches, and I'm not really enjoying the forced inactivity either. I want to go sew! I keep telling myself to be patient. Wish me luck with that! Hee hee! I'm trying to post more often now, because Instagram is fun, but it's like eating fast food when what you really want is a home-cooked meal. I've missed blogging and the blogging community. 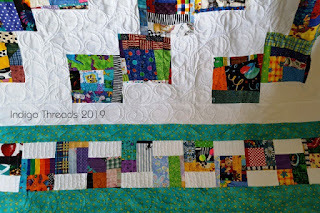 I love reading everyone's blog posts and seeing what they're doing, and I love sharing what I'm up to and what I'm making and, of course, getting comments from everyone. They really make my day! In case you don't do IG, here is the collage of my most favorited photos on Instagram. And yes, that's me in the middle! It may be the only picture you see of me. hee hee! And lots of wonky stars this year. More on that in another post. And here is my Year of Color, based on my Instagram posts this year. I'll still be posting on Instagram in 2019, but I'm also going to try to post more often here as well. 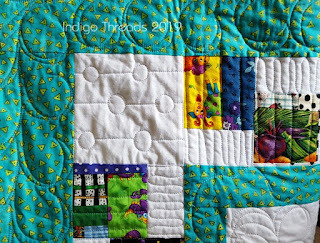 Hopefully I'll get more sewing/quilting done in the new year, so I actually have something to share. I've got lots of plans. Happy New Year everyone! 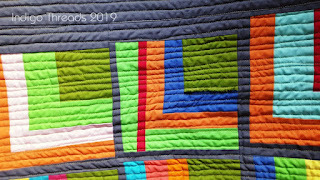 I hope 2019 is a good year for all, with lots of quilts and quilting! We had a great time Christmas Eve at our oldest son's home with his family, and then a quiet day on Christmas, just the 3 of us at home. It will be a quiet New Year's for us too. We're going to watch the Dr. Who special and play board games. I'm looking forward to it. 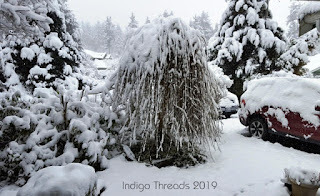 Fortunately, we had some honest-to-God bright sunlight this morning for the first time in days, so I could get some photos I've been wanting to take for a while now. It's been so very dark and rainy here, and just terrible lighting for photos. So this was a wonderful opportunity! Plus, sunny makes us happy here! 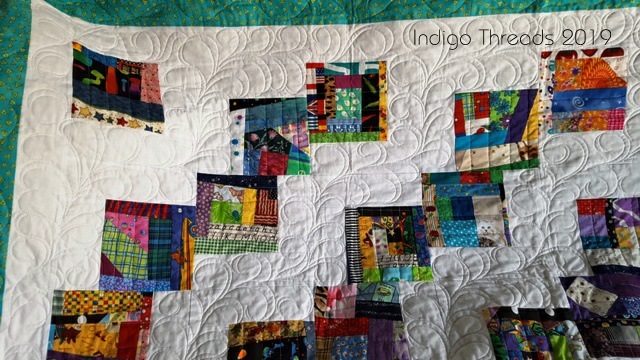 This is based on a couple of quilts in Alexandra Ledgerwood's book Improvising Tradition. I had to use mostly batiks to get the right tones of tropical blues and greens. 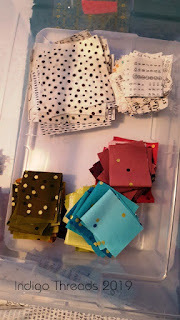 Fortunately, I have a small bin of batik scraps, which came in very handy! I just sat down and started doing some improv log cabin-y blocks, which is my favorite kind of creativity! When I liked what I had with the blocks, then I had to figure out the right proportions for a tablerunner. It wasn't too hard, and I'd like to do another one of these. 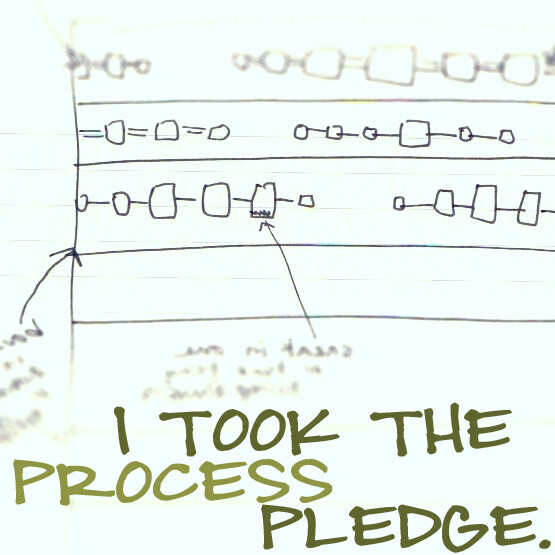 I made notes so I could repeat this! The quilting design was courtesy of my DS. 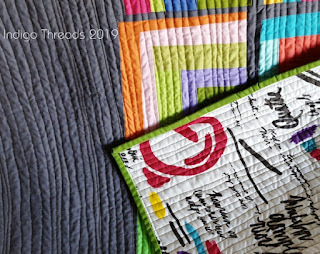 He drew a sketch and then was kind enough to draw it on the quilt sandwich with a hera marker, making the quilting very easy. Leigh Ann seemed very happy with this! 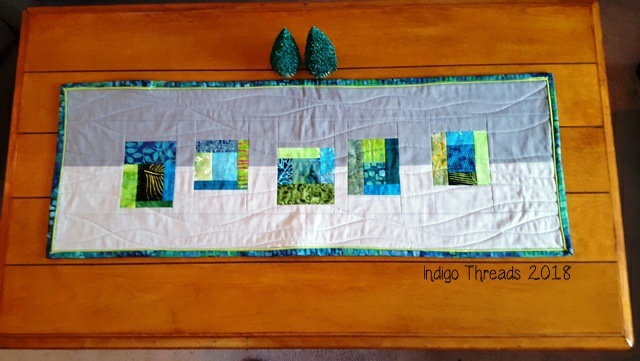 This was gifted to me, and made by LaDonna. 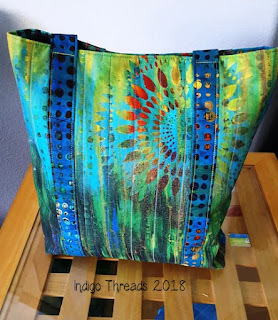 A great tote bag! I love that off-set pocket! 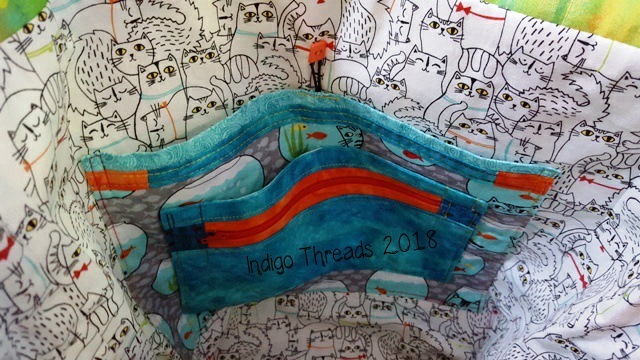 I love all the pockets on the inside! 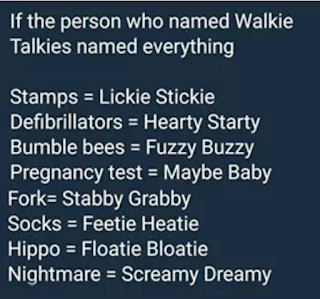 Those are always handy. 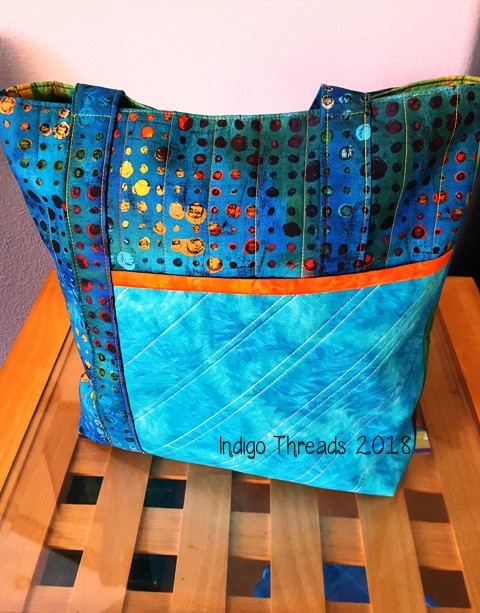 I think all tote bags should have multiple pockets - LaDonna must have read my mind! 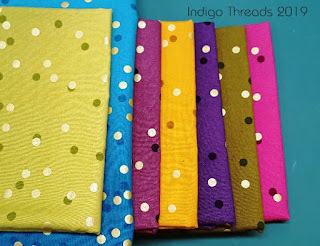 And the fabrics she chose are so fun! Kitties and then goldfish swimming in bowls for the pockets. I don't talk a lot about myself on here, but I will say that I'm glad to see 2018 end. It has been a tough year. Dear Son was sick for a lot of it, Dear Hubby was traveling for a lot of it and I got to take up the slack. 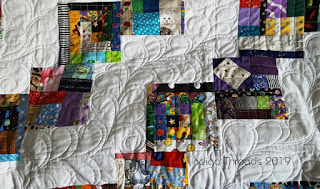 Which didn't leave much time for quilting. :( Then I broke 3 toes in July and found out I have osteoporosis. DH retired the end of August, which he really needed. All that world traveling was taking a toll. Fortunately, he's around now that I need him, because in October I injured my foot. The doctor thought it was a sprained ankle. I rested it and used a cane to walk with and then in November I started physical therapy for it. But by December, it was much worse! So I quit P.T. and went back to the doctor. I've been staying off of it as much as possible and using a cane to hobble around. Wednesday the 2nd I'm going to have an MRI to find out what is going on and how bad it is. I'm kind of dreading finding out - I don't want to have surgery! So, I'm hoping for good news in January! Cross your fingers or say a little prayer for me, please! 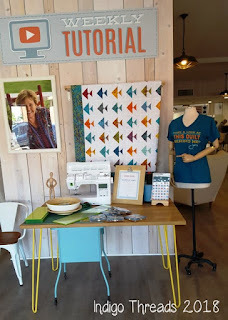 Since I made my tablerunner with a bin of scraps, I think it qualifies, so I'm linking up with Oh Scrap! 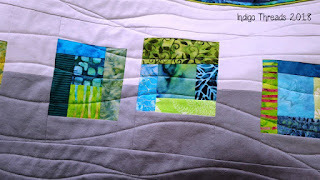 over at Quilting Is More Fun Than Houseworrk. 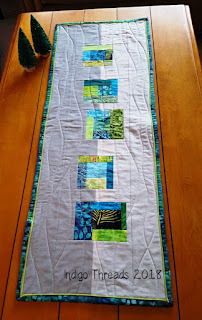 Still not much going on around here, but I did manage to get some sewing accomplished. Yay for me! 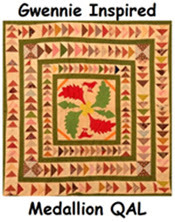 My quilt guild was having a workshop on the Falling Charms quilt (which I first saw on Crazy Mom Quilts blog here, and then found out that Missouri Star's Jenny also has a tutorial here), so I decided to play along. 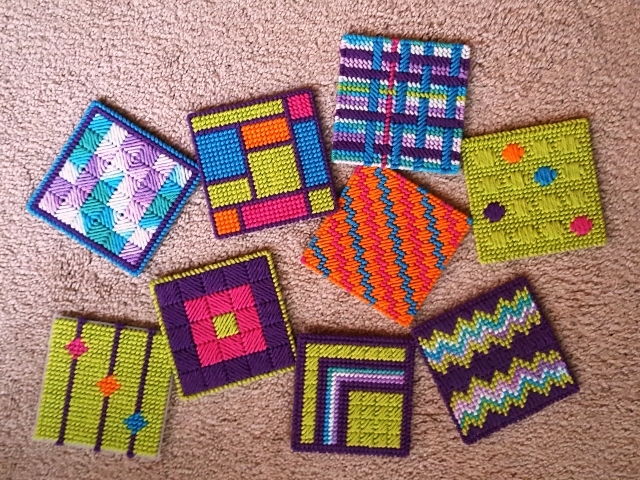 After some consideration, I realized that I didn't have 2 packs of charm squares that weren't already spoken for, so I decided to use my 40 Crumb Blocks that have been languishing for a few years. At 6 inches, they were an inch bigger than the pattern calls for, but if you know me, you know that I don't do well at following patterns anyway! 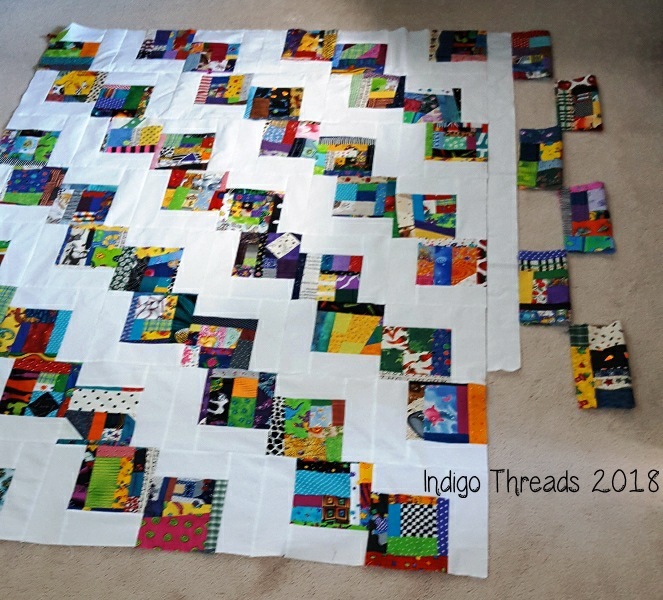 So, after some quilt math and a few adjustments, I knew what I was doing and was hard at work getting fabric ready for the workshop! 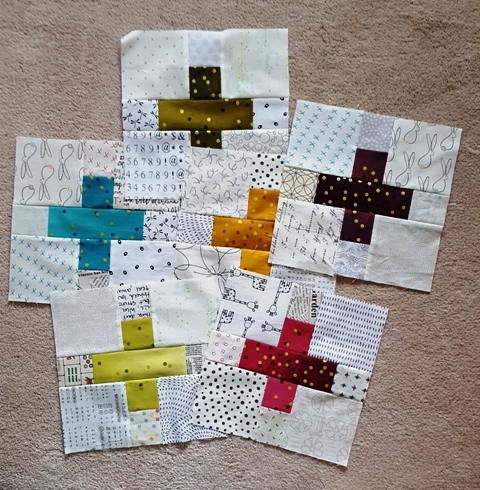 Here are some of my blocks - just easy peasy! Needless to say, I didn't complete my project at the workshop ( I just don't sew that fast! 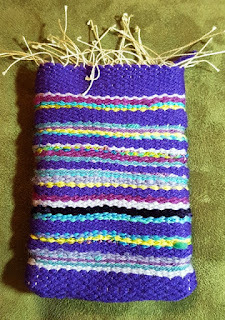 ), but I kept working when I got home and eventually I completed the top. 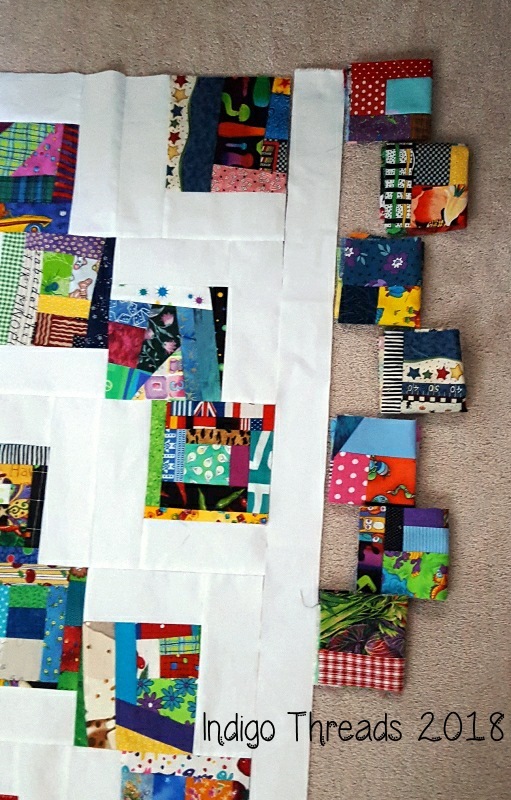 I have to say, as easy as the blocks were. it was surprisingly difficult to get the blocks in the right position! Suzanne, who led the workshop, gave us the tip that the white on the blocks should be "L"'s and "7"s. That tip saved me some grief! At that point I started thinking about borders. I also had some 8 inch Crumb Blocks that I thought I should use up too. They're not my favorites somehow. So I considered how best to use them. First I thought of slicing them into rectangles. Ok, but not what I wanted. 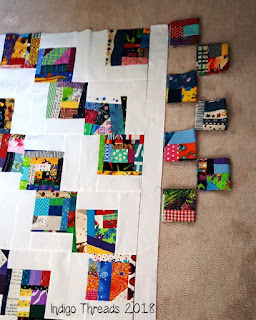 Eventually, after looking at all of this laying on my "design floor" (the living room) for a few days, I got the idea to offset the squares some, just like in the body of the quilt. That was IT! More math was involved and I figured out how I wanted to accomplish that effect. 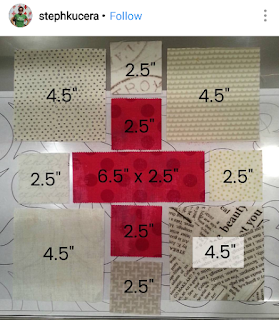 I'm no math whiz but for some reason, I can usually do quilt math! 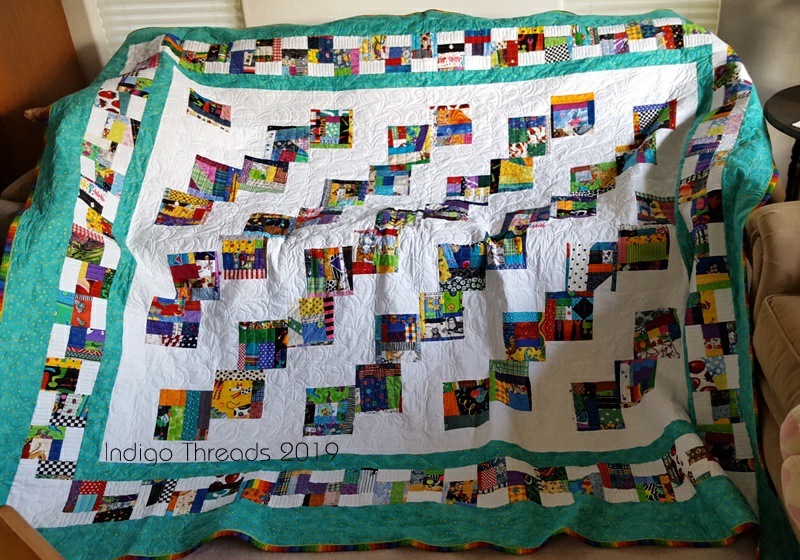 Right now we're having a terrible heatwave and I cannot sew up in my quilt studio as we don't have A/C. It's just too hot to sew anywhere at the moment! I'm crossing my fingers that the heatwave will break soon, hopefully on Wednesday, and then I can do some more sewing. 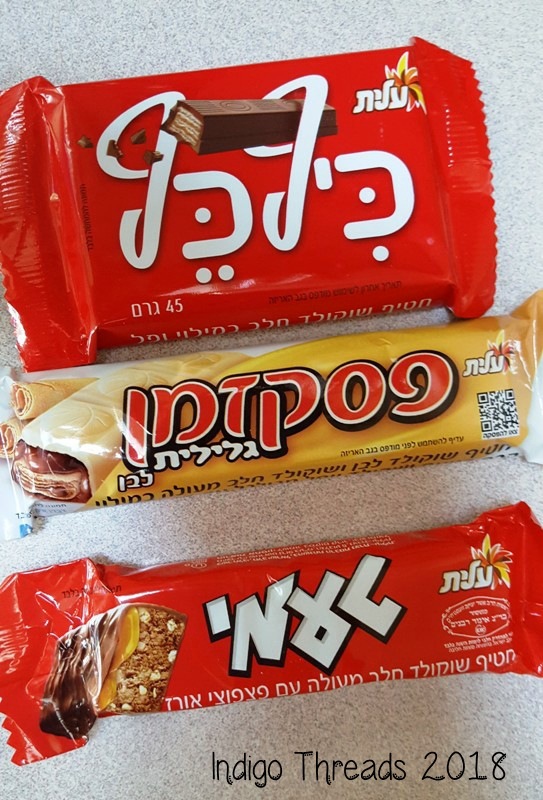 Recently my DH traveled to Israel for work. 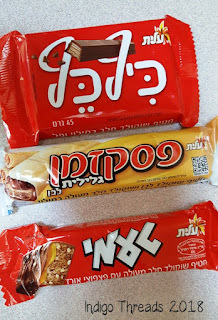 He brought back some candy bars for us to enjoy. We've eaten two of them and they were both excellent! A little different from American candy, more like European candy but not quite the same either. 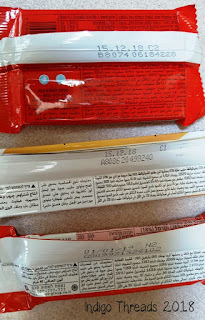 What was really interesting, to me at least, was the contents labeling on the back. 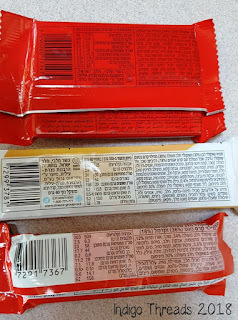 If the flap is folded one way you can read the Hebrew words. 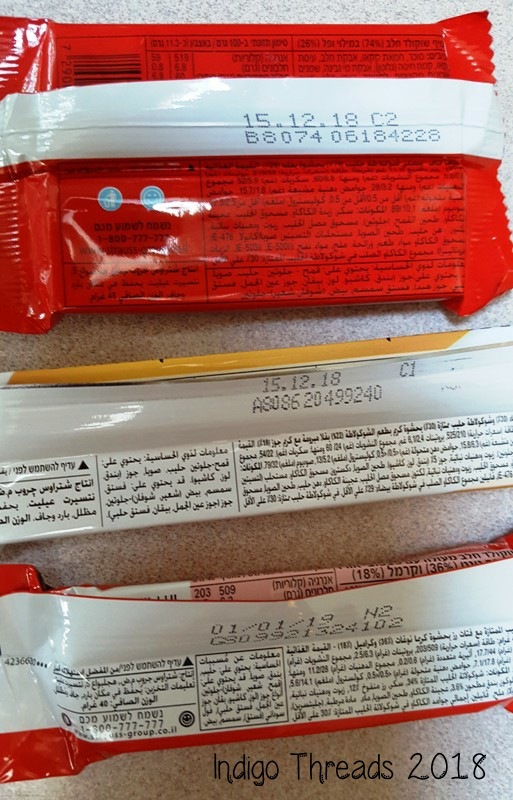 But if you turn the flap the other way, you can read the label in Arabic. Very clever! It's always interesting to see how other countries are just so similar and yet different from Americans. And bonus! 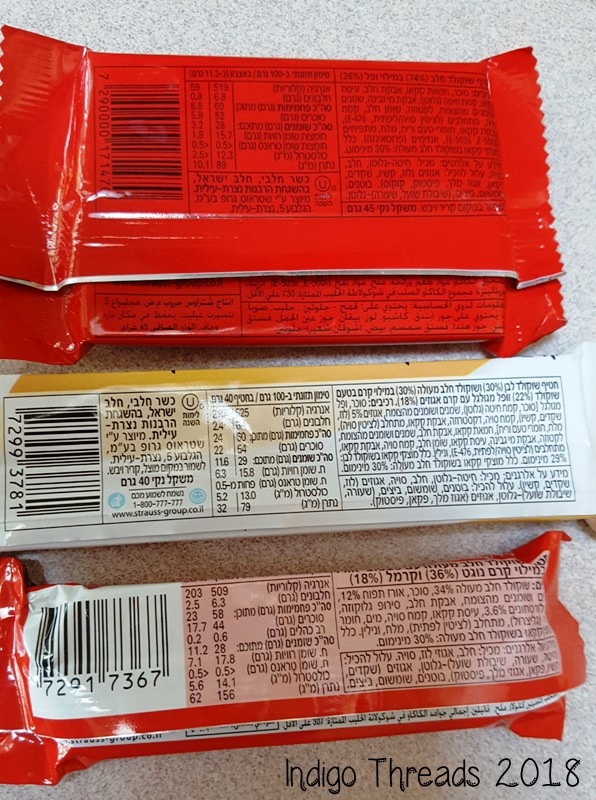 The candy is yummy! I haven't blogged since February. Wow, time flies. I hardly know where to start. It's been a very long 6 months. I mentioned in my last post that our son was ill and had surgery. Well, his recovery took way longer than we thought. He finally came out of it by May/June. During that time, my husband was traveling a lot. And when he was home, he was sick. (one of the joys of flying these days) I got something too, that took me too long to recover from. Like I said, not a good 6 months. 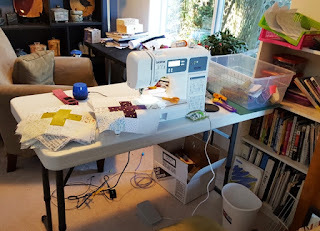 And I was so busy and/or sick, I couldn't get any sewing in, or blogging or anything to blog about. So, I was quite frustrated. 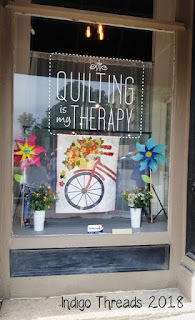 However, in May I took the trip of a quilter's lifetime! I took a trip with my California friends and guess where we went? 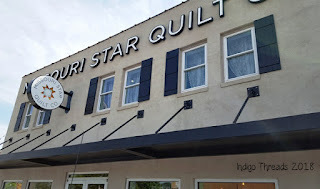 Yup, we went to Missouri to visit Missouri Star Quilt Company, and about 6 or 7 other quilt shops, some in Missouri and a few in Kansas. OMG, that was sooo fun! Needless to say, I've shot my fabric budget for the year! This was one of our 1st stops. 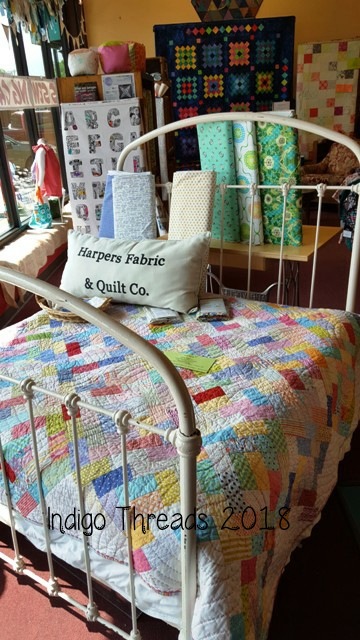 Harpers Fabric & Quilt Company, in Overland Park, Kansas. 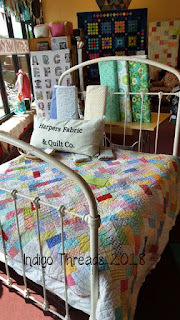 This was a great shop and we all bought fabric here. Actually we all bought at least something in every shop we visited! 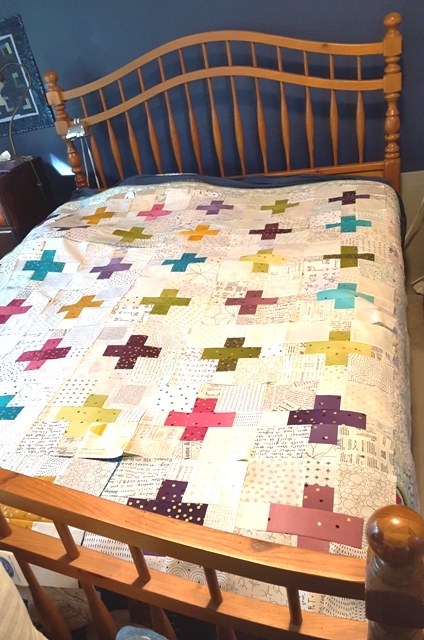 I love the quilt on the bed. 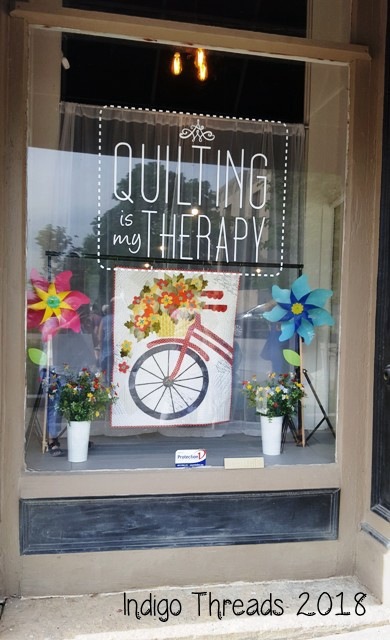 I think our last stop on Thursday was Angela Walters' shop Quilting Is My Therapy in Liberty, Missouri. 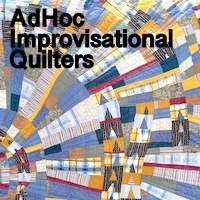 If you've seen The Midnight Quilt Show, you've seen Angela. 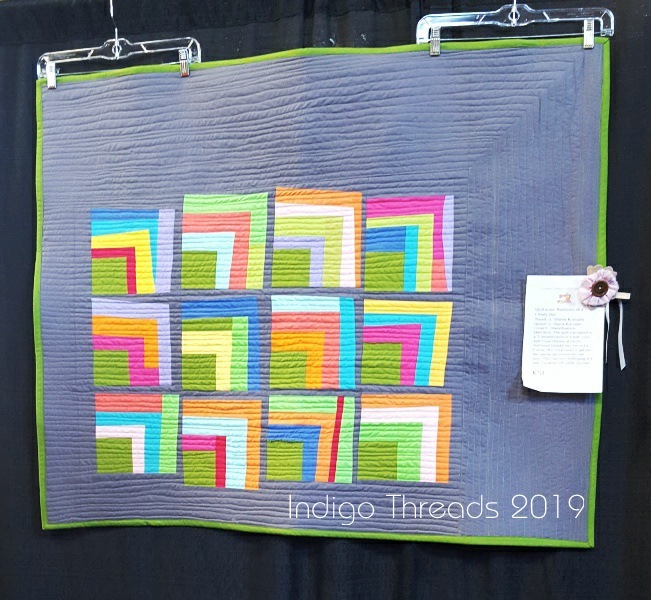 We were hoping to get to meet Angela in person, but sadly, she was at Quilt Market at the time. This was our group at breakfast on Friday as we were about to go to Missouri Star. I think you can tell how excited we were! 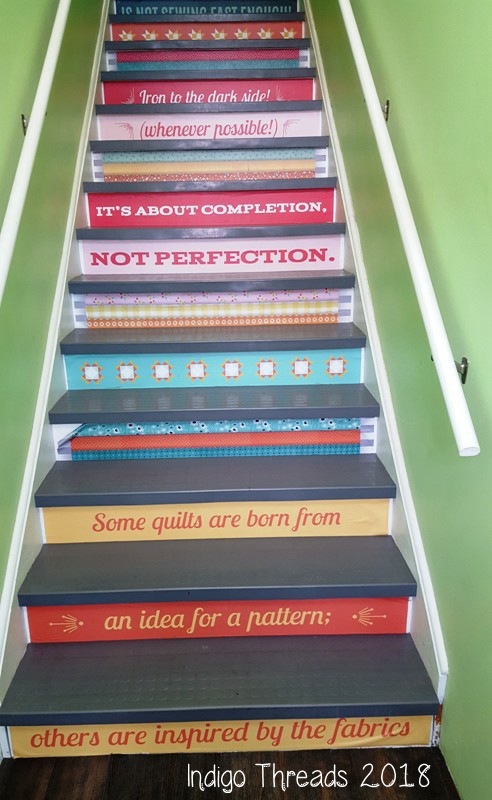 When you first walk into the main building of MSQC in Hamilton, MO, this is what you see. 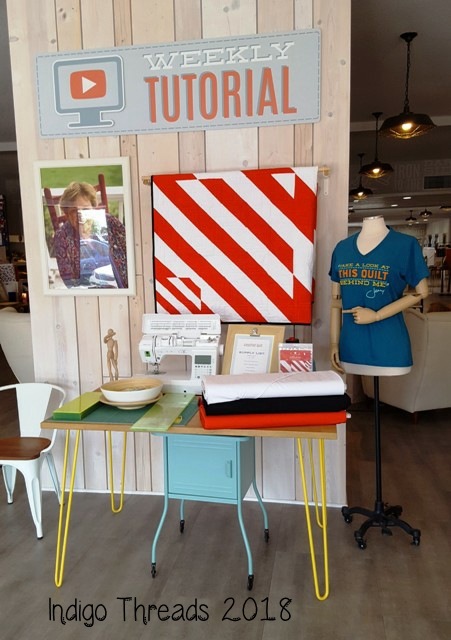 A display of the latest weekly tutorial from Jenny, as well as any Daily Deals. 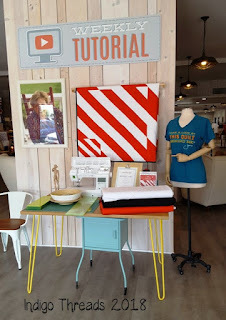 And this was the new display on Saturday. 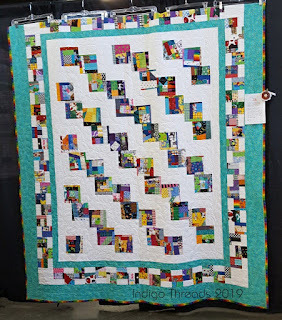 We were hoping to meet Jenny while we were there, but again, she was at Quilt Market. Bummer! 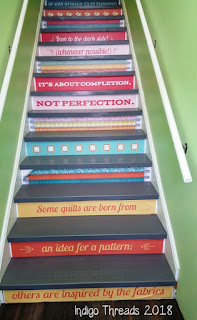 This was the stairs up to one of the shops in another of the MSQC buildings. I thought it was real cute. By the way, we found out that JC Penney grew up in Hamilton. His childhood home was just down the street a little ways from MSQC's main building. We stayed at a hotel in St.Joseph, MO. We learned that it is the home of the Pony Express. It ran from St. Joe all the way to Sacramento, Calif. This is a mural across the street from the museum. The museum was fun and also educational. Just down the street from here was Jesse James' childhood home. We didn't get to see that, as we had to head back to the airport. If you ever get the chance to go to Missouri Star, I urge you to go! It was so fun, everyone was so nice and Missouri is a beautiful state! 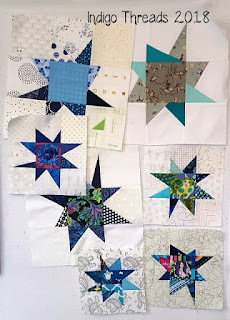 I know I mentioned in my last blog post that I was doing an on-line swap of wonky stars. 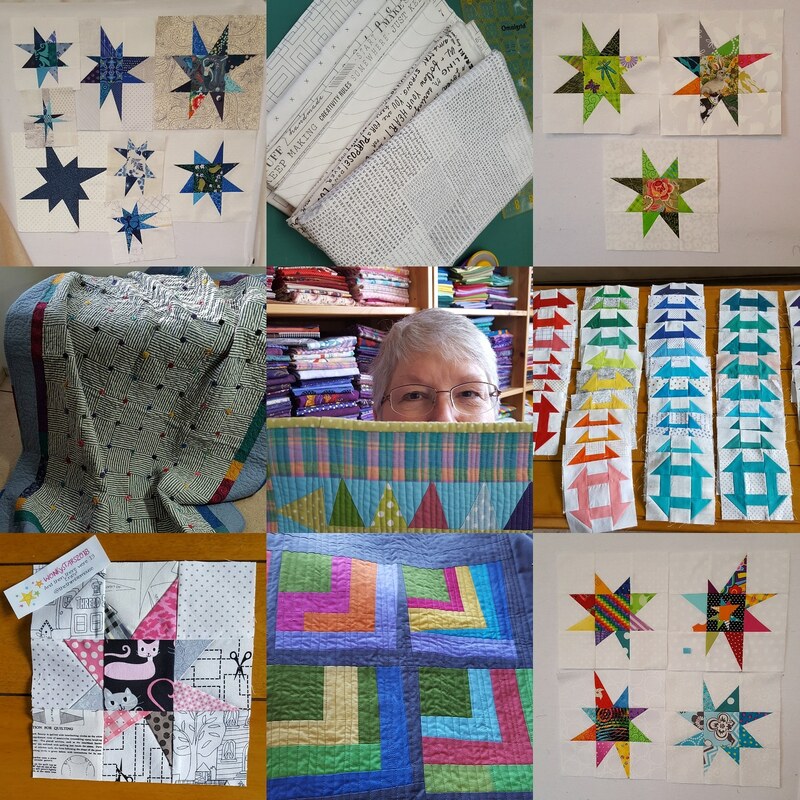 This is just about half of the stars I received. Aren't these fun? I haven't yet gotten a photo of all of them together. I've got two quilts to finish and then I want to start working on this. I mentioned on my last blog post another swap I was going to do this spring, the 6 inch Churn Dash block swap with Barb of Fun with Barb blog. 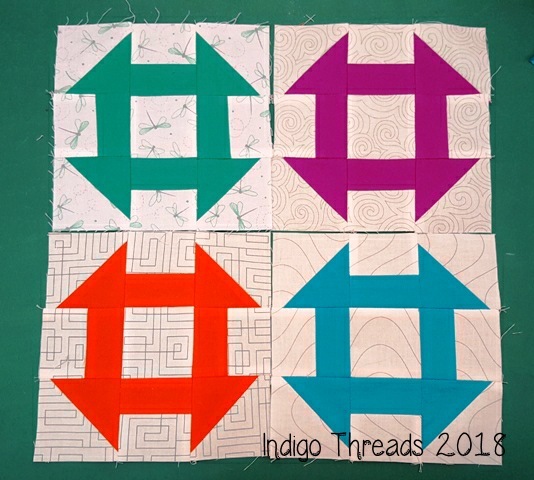 Here are my 4 different fabric runs for the blocks made for the Modern group. We had to use at least 2 different fabric pairings. 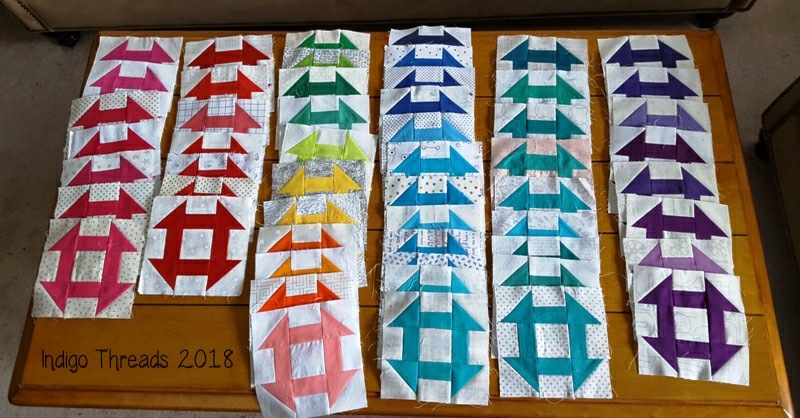 After lots of cutting and sewing, here are all 54 of my Churn Dash blocks ready to swap! 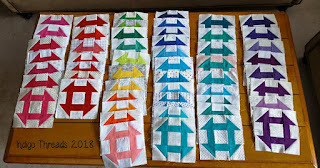 If you're interested in making some 6 inch Churn Blocks for yourself, here is the link to Barb's tutorial for them. Actually, the tutorials for all the blocks for all the swaps are on this page. The Churn Dash blocks are at the bottom of the page. 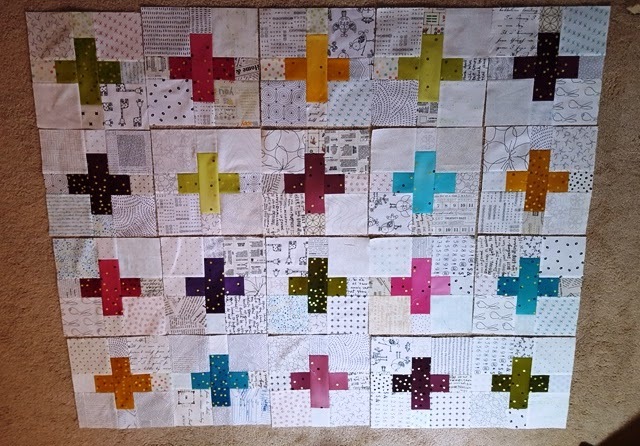 Here are all of the blocks I received in the swap, laid out in color order. Aren't they wonderful? 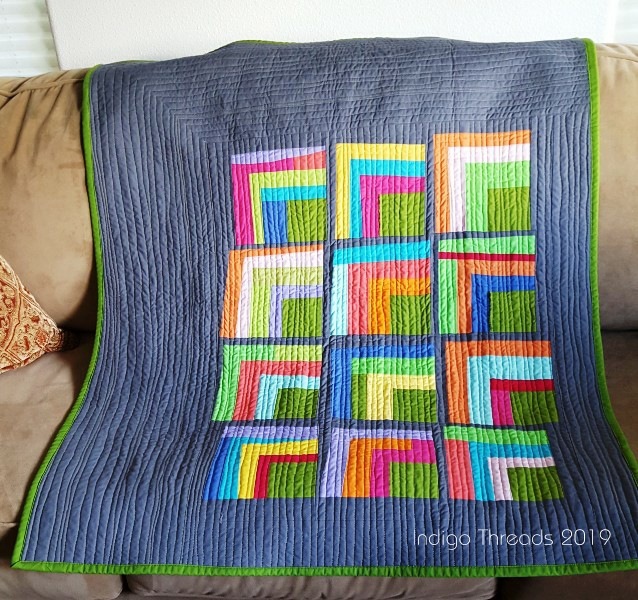 Rainbow order always makes me happy! A huge Thank You to my swap buddies! I plan on being back soon, as I still have more to share with you. Have a creative week!